We all know that summer is the perfect time to naturally raise Vitamin D levels by getting outside. All it takes is 10 – 15 minutes of skin exposure (specifically UVB exposure) per day to get a healthy dose of Vitamin D.Those 15 minutes must be on skin without sunscreen and an optimal 30 – 50% of your skin exposed (ie legs and arms). Low levels of Vitamin D can correlate to low bone density, poor immune function, depression, auto-immune disease, hair loss and more. Vitamin D helps important nutrients such as calcium, magnesium and zinc absorb into the body from the foods and supplements that you eat and take. The active form of Vitamin D is D3 and it requires both sunshine and good kidney health to become active. 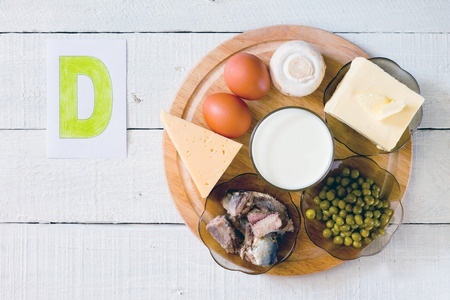 Food sources are difficult to find naturally which is why milk and nut-milks are often fortified with Vitamin D. Some mushrooms, fatty fish and liver do contain Vitamin D, but it is often recommended to supplement in addition to dietary sources. How much should you supplement? To support the many health benefits of Vitamin D, the best way to know how much to take is by having your Vitamin D 25-OH levels tested by blood. In BC, the medical service plan will not pay for this test and instead residents are asked to pay out of pocket, regardless of if the requisition is from a naturopathic physician or a medical doctor. The daily dose range can vary from 1000 IUS per day up to 10,000 IUS or more in special circumstances. Blood level ranges will help your naturopathic physician to determine the right dose for you. There is controversy in the medical world as to the most optimum blood levels, but most agree that between 100 – 125 nmol/L represents a strong level. Now, did it take supplementation to help you achieve this range? If so, you probably need to continue taking Vitamin D in an oil-based form to maintain it. If you would like to determine your Vitamin D status and your individual supplementation amount, please schedule a consultation and blood test. This entry was posted in health, Tips, Vitamin D on September 2, 2017 by Tasreen Alibhai.